Ok, I’ve broken my promise. I’ve said that the previous post would have been the last one about MVVM, but I’ve changed my mind I realized, in fact, that I didn’t talk about one of the most interesting pros of working with the MVVM pattern: design time data. In one of the posts of the series we’ve talked about dependency injection, which is an easy way to swap the implementation of a service used by ViewModel. There are various reasons to do that: to make refactoring easier, to replace the data source in a quick way, etc. There’s another scenario for which dependency injection can be very useful: helping designers to define the user interface of the application. If this requirement is simple to satisfy when it comes to static data (like the header of a page), which are rendered in real time by the Visual Studio designer, things are a little bit more tricky with dynamic data. It’s very likely that most of the data displayed in the application isn’t static, but it’s loaded when the application is running: from a REST service, from a local database, etc. By default, all these scenarios don’t work when the XAML page is displayed in the designer, since the application isn’t effectively running. 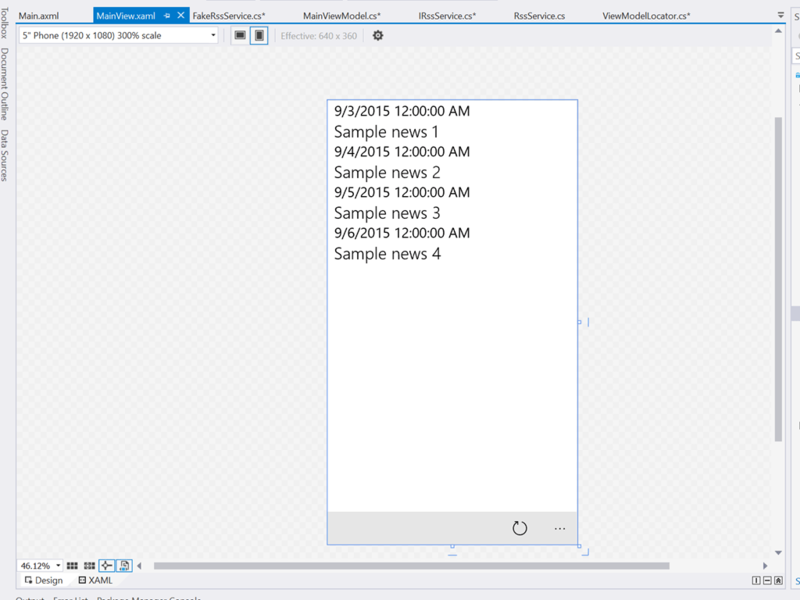 To solve this problem, the XAML has introduced the concept of design time data: it’s a way to define a data source that is displayed only when the XAML page is displayed in Visual Studio or in Blend in design mode, even if the app isn’t effectively running. The MVVM pattern makes easier to support this scenario, thanks to the separation of layers provided by the pattern and the dependency injection approach: it’s enough to swap in the dependency container the service which provides the real data of the app with a fake one, which creates a set of static sample data. However, compared to the sample we’ve seen in the post about the dependency injection, there are a couple of changes to do. Specifically, we need to detect when the XAML page is being displayed in the designer rather than at runtime and load the data from the correct data source. To do this, we use again one of the features offered by the MVVM Light toolkit, which is a property offered by the ViewModelBase class that tells us if a class is being used by the designer or by the running app. Then, the interface is implemented by two classes: one called RssService, which provides the real data from a real RSS feed, and one called FakeRssService, which provides instead fake static data. Title = "Sample news 1"
Title = "Sample news 2"
Title = "Sample news 3"
Title = "Sample news 4"
Before starting to explore the changes we need to do in the application to support design data, I would like to highlight a possible solution to handle asynchronous operations. One of the challenges in creating fake data comes from the fact that, typically, real services use asynchronous methods (since they retrieve data from a source which may take some time to be processed). The RssService is a good example: since the GetNews() method is asynchronous, it has to return a Task<T> object, so that it can be properly called by our ViewModel using the await keyword. However, it’s very unlikely that the fake service needs to use asynchronous methods: it just returns static data. The problem is that, since both services implement the same interface, we can’t have one service that returns Task operations while the other one plain objects. A workaround, as you can see from the sample code, is to use the FromResult() method of the Task class. Its purpose is to to encapsulate into a Task object a simple response. In this case, since the GetNews() method returns a Task<List<FeedItem>> response, we create a fake List<FeedItem> collection and we pass it to the Task.FromResult() method. This way, even if the method isn’t asynchronous, it will behave like if it is, so we can keep the same signature defined by the interface. In case the app is being rendered in the designer, we connect the IRssService interface with the FakeRssService class, which returns fake data. In case the app is running, instead, we connect the IRssService interface with the RssService class. Only if the app is running in design mode, we retrieve the data from the service and we populate the News property, which is the collection connected to the ListView control in the page. Since the GetNews() method is asynchronous and you can’t call asynchronous methods using the async / await pattern in the constructor, you need first to call the Wait() method on the Task and then access to the Result property to get the list of FeedItem objects. In a real application this approach would lead to a synchronous call, which would block the UI thread. However, since our FakeRssService isn’t really asynchronous, it won’t have any side effect. This sample shows you also the reason why, in case you wanted to make things simpler, you can’t just call the GetNews() method in the constructor also when the application is running: since we’ can’t properly use the async / await pattern, we would end up with unpredictable behaviors. As such, it’s correct to continue calling the data loading methods in the page events that are triggered when the page is being loaded or navigated: since they’re simple methods or event handlers, they can be used with the async and await keywords. The designer has created an instance of our ViewModel, which received from the dependency container a FakeRssService instance. Since the ViewModel is running in design mode, it will excecute the code we wrote in the constructor, which will retrieve the fake data. Nice, isn’t it? Thanks to this implementation, we can easily see how our collection of news will look like and, if it doesn’t satisfy us, easily change the DataTemplate we have defined in the ItemTemplate property. As usual, you can find the sample code used in this blog post on my GitHub repository: https://github.com/qmatteoq/UWP-MVVMSamples Specifically, you’ll find it in the project called MVVMLight.Advanced. Happy coding! This entry was posted in Universal Apps, UWP, wpdev and tagged MVVM, Universal Windows Platform, Windows 10. Bookmark the permalink.